One may easily spend the fall and winter bouncing from one holiday into the next, and often those celebrations are hosted at someone else’s abode. Why not extend thanks by inviting those friends and family to a small gathering that doesn’t involve candy, pumpkins, or trees. 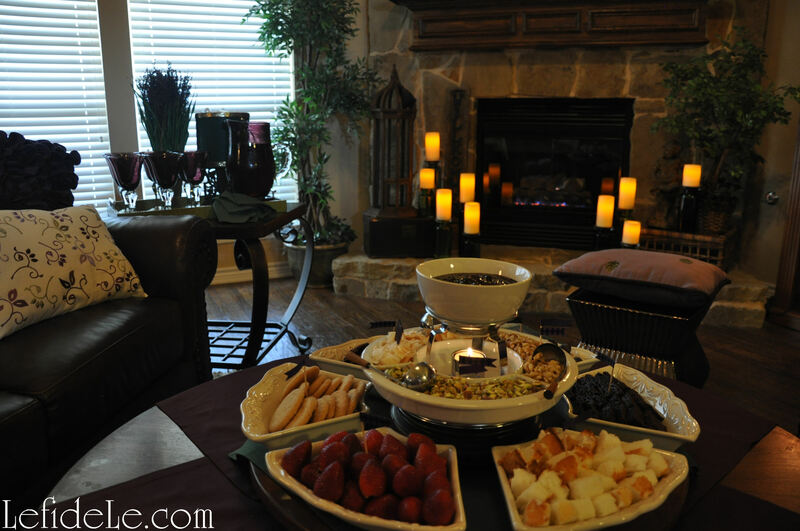 This easy fondue theme can be quickly pulled together the evening before. 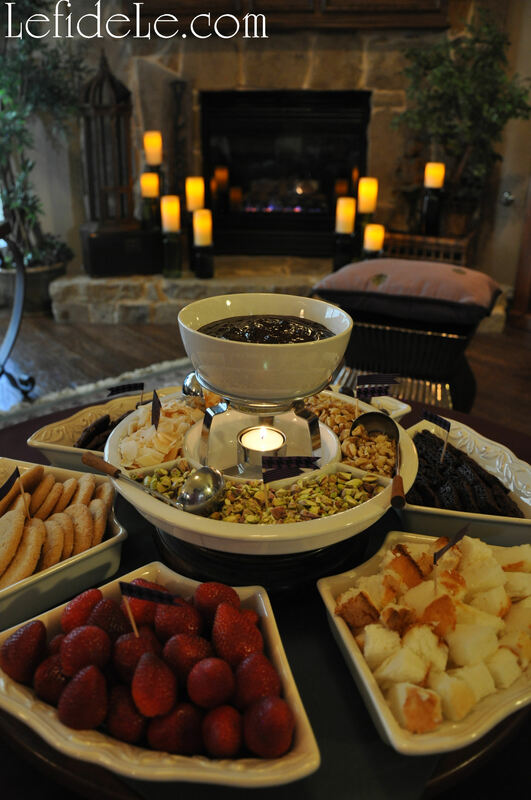 See my accompanying Quick & Easy Chocolate Coconut Fondue Recipe here. It takes about 5 minutes to prepare just before everyone arrives. It is vegan, gluten-free, and dairy-free so no one has to be left out. (Just be sure to buy or prepare gluten and dairy-free items to dip also.) An informal dessert party can accommodate a larger number of people without adding more work, which is great not only during the busy holidays but at any time of year. I chose the warm and inviting colors of purple and green in order to distance my theme from those traditionally used for the holidays. 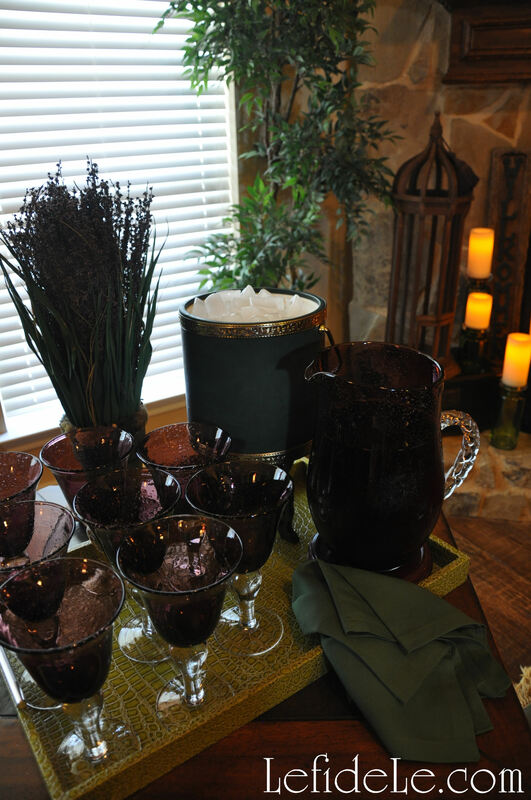 They were a lovely contrast to the ivory dishware and dark brown of the chocolate and leather. 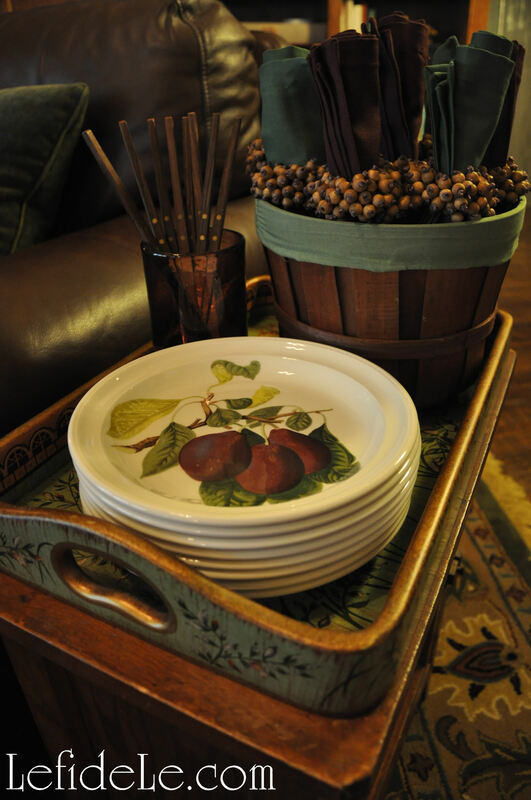 Color accents were seen in the throw pillows, trays, glassware, dishes, and even the foliage. 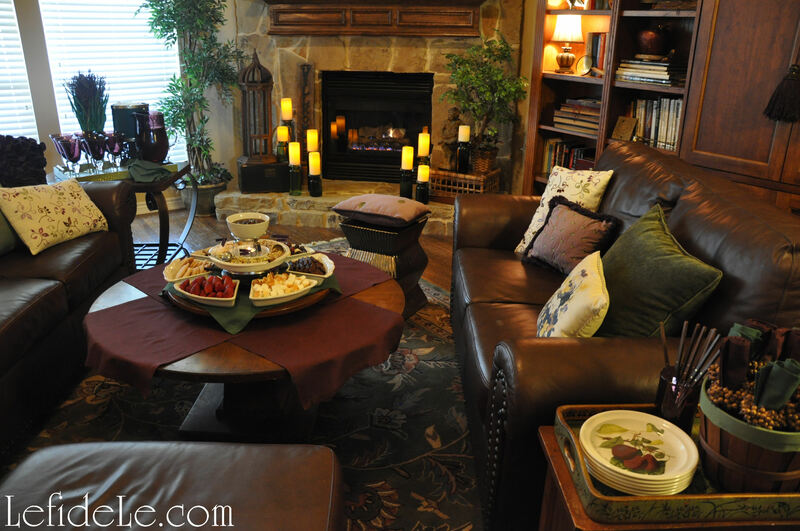 It extended to the cloth napkins that were set on the coffee table and lazy-Susan. Adding the rotating tier not only eased food accessibility, but also created separation between the serving and eating areas which was visually more appealing. Seated on an end table was a painted tray that contained a basket of coordinating napkins in wood beaded rings, a glass holding fondue skewers, and Portmeirion Pomona plates. I only used the plates with the pear and fig motif because they matched so perfectly, but even pretty paper plates would be fine for such an informal gathering. Another table held a larger tray with purple bubble glasses and a matching pitcher seated on a wooden riser. An ice bucket was placed on a taller stand behind that. A cloth napkin was draped to preemptively contain any spills. Preserved lavender sat in a painted pot to soften the visual edges. All of the furniture was rotated, for the evening, in order to accommodate an easy flow. An ottoman and a ceramic stool added seating to the arrangement, without blocking pathways. 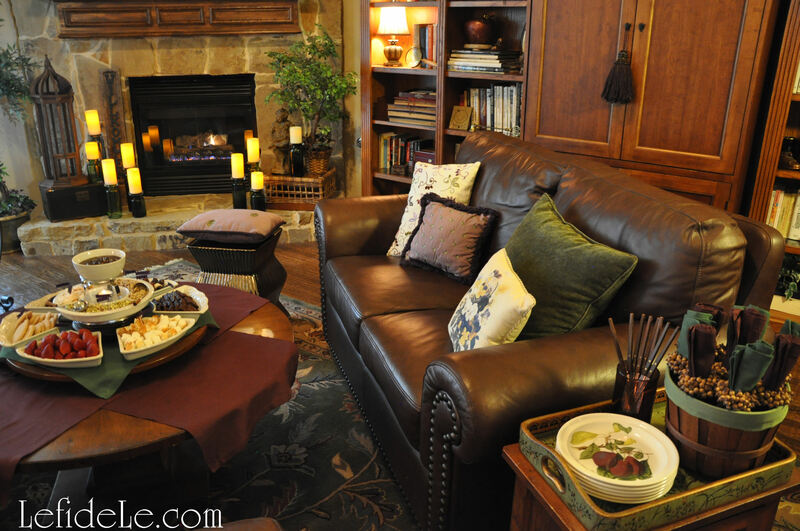 Pillows in coordinating colors were pulled from other rooms, to temper the masses of brown leather. For a smaller group, one could even pull furniture from the room, and just use stacked floor cushions around a coffee table. 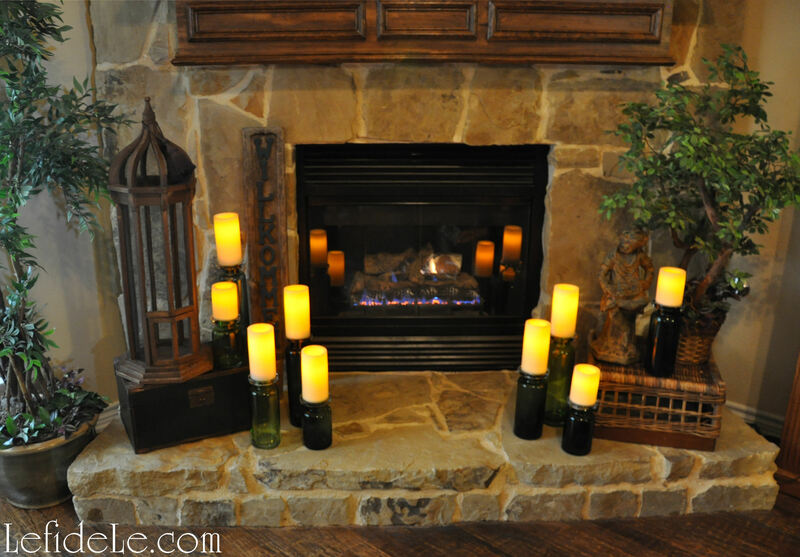 Even the rock fireplace was included as a focal point with the addition of candles on green glass. These were placed at varying levels by means of a trunk and upturned basket. Statuary, a birdcage, and small trees added height and interest. Why not switch accessories for a night? The serving pieces are actually comprised of two different sets of dishware. 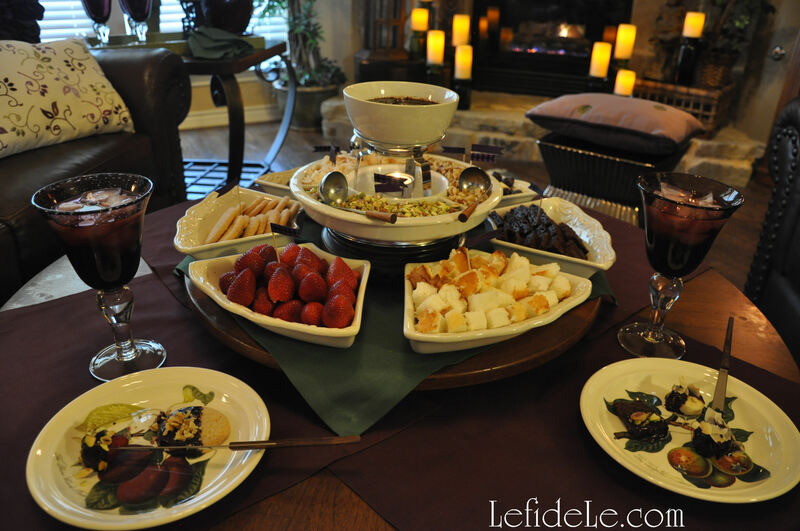 The center group is a small fondue set placed on a wooden stand for height. The ring of dishes surrounding that was actually meant to coordinate with a plain bowl for hors d’oeuvres, but worked beautifully to present a larger volume of food. 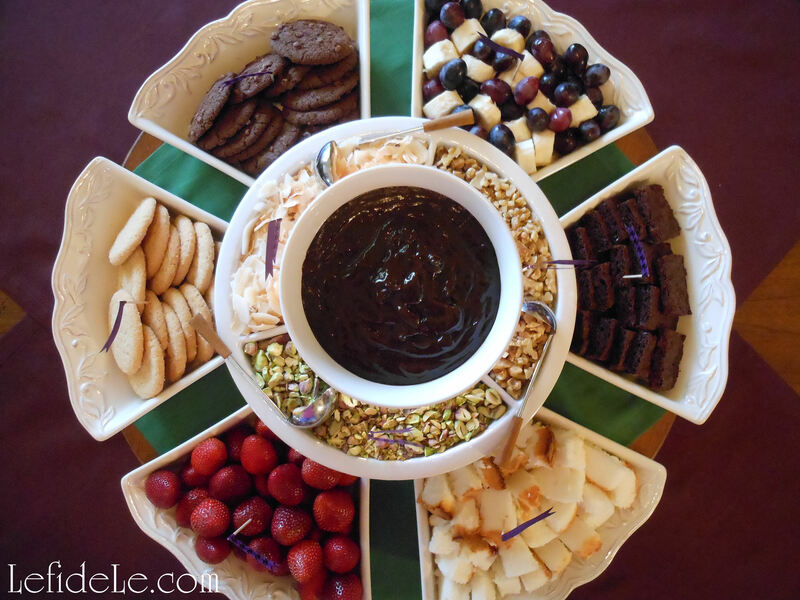 Round bowls would also have been lovely surrounding the chocolate center. Whether you choose to serve on paper plates or fine china, change up your décor or leave it all the same, bake your sweet treats or buy them at the store… your guests will be treated to a relaxing evening filled with delightful confections and camaraderie.